Interests - She likes story writing, make-up, lush, loom bands and Liverpool FC. Courtenay was born on the 3rd October 1999. From the age of around 2 months, I noticed that her head was to one side. I asked the GP at her baby clinic and he told me that there was no need to worry, it was just a lack of head control, and at the time I accepted this. When she reached the age of one year her head was still to the one side and she was sleeping less and less. Her behaviour was also getting worse. She had brown patches but I didn’t think anything of it because I had them and so did her 2 other sisters and my Mum. I revisited my GP and insisted on a referral to the hospital, the paediatrician there put her problem down to glue ear and said she was purposely putting her head to the side because she was shy Courtenay is anything but shy! I left it at this though deep down I knew there was something wrong and I didn’t know what. For the next 3 years it was the same. I was wary of going back to my GP because he said i was an over protective mother due to my other children also having problems at the time. Then in December 2003 I was taken into hospital doubled over in severe pain at first and I was thought to have appendicitis. The doctors did an ultrasound scan followed by a CT scan. They found a big tumour attached to my pelvis, spine and travelling down my right leg. It was thought to be malignant and I was transferred to the Royal Marsden hospital in London. There I was diagnosed with Neurofibromatosis. This set the ball rolling and everything started to slot into place. 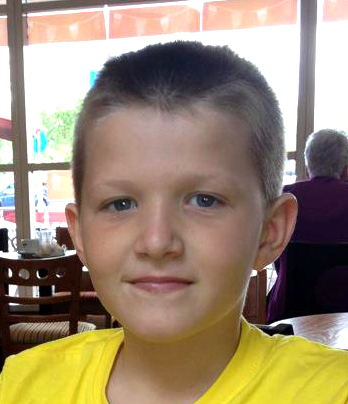 The whole family were referred to a geneticist and tested for NF1. Courtenay and her 2 sisters were also diagnosed with NF. It was such a relief to find out that I was not going mad and the children’s problems were not all in my head. First Courtenay’s oldest sister was late sitting, walking, and had problems feeding. She was very underweight and small for her age. She also had lots of cafe-au-late spots, but they were overlooked. I was told I was worrying about nothing and it was normal for first time mums. Secondly, Courtenay’s behaviour was put down partly to our parenting and her neck was over looked. Armed with new knowledge, I visited her (thankfully new) GP. He took me seriously and suspected scoliosis and organised X-rays which confirmed this. Her spine is S shaped and her hips are lopsided causing her head tilt. Since then everything has gotten better for us and we have more support from doctors etc. Courtenay tries not to let this restrict her when playing football, but she is not able to play for longer than 10 minutes due to the pain. Her doctors allow her to play football but she has to take it easy, no saving goals etc. Courtenay will probably have her brace next year, even sooner if it progresses. Regarding Courtenay’s younger sister Tyanna, luckily after my diagnosis she had support from the start. She has developmental delay and attends a main stream school with one to one support. Having 3 other siblings with special needs and also having problems myself, it takes its toll on Courtenay and her behaviour can be challenging. She can be aggressive to her siblings but is always very remorseful because she often does it on impulse without thinking. She often comes home from school upset because she so often has to play alone at break times. Courtenay is a loveable, chatty and very funny little girl and would love to make new friends to exchange letters with. She is always writing me letters and posting them under my bedroom door. Courtenay still sings in various singing competitions, she loves singing and sings constantly at home and in the car. She had a fantastic time in Bulgaria and made a lot of new friends. She enjoyed trying new foods and swimming in the pool. She started back at school at the beginning of September and this year she’s doing her exams. I think she’s going to stay on an extra year and then going on to college to do midwifry. We are still waiting for an appointment for her to see her back specialist. The last two appointments have been cancelled by the hospital for some reason and so we are waiting for another which will hopefully come soon. Courtenay is growing up fast, she’s in her GCSE year and is currently doing a lot of revision. It only seems like yesterday that she started in comprehensive school. When she leaves school she wants to go in to midwifery so she has a lot of work and studying to do. Courtenay is having a lot of problems with her back and it is causing her a lot of pain and discomfort. Courtenay has an amazing voice and loves competing in singing competitions. She can sing anything from rock to ballards. When she has some spare time she loves sitting and looking after her disabled grandfather and helps around the house and makes him tea etc. She also loves going to the caravan and helping down there during the school holidays. Courtenay’s back problem has become a bit worse (pain wise) and scan results show that even though the curve hasn’t decreased as badly as they first thought, a brace wouldn’t be helpful as yet. They also diagnosed another problem called sheuermann’s disease which causes a curve at the top of the spine. This means she now has an S shaped one at the bottom and a C shaped one at the top, so it’s no wonder she’s in a lot of pain. The doctor has referred her for more physio which I’m a big skeptical about as last time it didn’t help at all. I’m also a bit angry as I read that sheuermann’s can sometimes occur with scoliosis when a brace could have prevented it. She was told she needed a brace years ago but it kept being held off. She has just enjoyed a lovely holiday in Bulgaria where she let nothing hold her back. She tried out all the big rides despite the fact that it caused her a lot of pain. She just wanted to be like other teenagers, which I can understand. She was a hit with other guests and often had them laughing. She also wowed them with her singing. She’s going into her GCSE years next year and wants to work her socks off as she wants to be a midwife. Along with her siblings, they made loom bands at the hotel on holiday using all their own bands and raised over £230 lev which is about £95 in our money. It’s to help send underprivileged children to Lapland. Thank you to everyone who has taken the time to write and send to the children, it’s really appreciated. Firstly, I’d like to thank everyone for sending cards, letters and parcels, to Courtenay, Tyanna and also Cameron. Courtenay is having a lot of problems with her back. She attended the Royal Gwent Hospital in Newport last Friday. She had x-rays and is currently waiting an appointment for an MRI scan to see what’s happening in her back. She has been advised to start going swimming on a regular basis to help her back muscles. Courtenay is still doing well at school and is going into her GCSE year. She’s decided to go to college to learn either midwifery or teaching. In April, Courtenay, Cameron and Tyanna are attending a week long PGL camp with me as one of the helpers. There’s a lot to organise and we are all looking forward to it. We will be abseiling, etc. Courtenay has had an up and down couple of months. The pain on her back has been getting worse causing more sleepless nights. It is often reducing her to tears but she keeps on going and tries not to let it restrict her, but she pays for it pain wise later on. Her paediatrician thinks that the hump on the top of her back is more pronounced and has referred her to her orthopaedic doctor for an emergency appointment, bringing the appointment forward by 4 months. She is seeing him on 6th September. Courtenay had a lovely time at the Post Pals party entertaining everyone as usual. She was really thrilled to see Kate W again and wouldn’t leave her side. They had quite a few giggles together. She enjoyed a lovely school trip to Paris. She loved visiting the art galleries and seeing the sites. She also enjoyed tasting snails for the first time – yuck!!!!!!!! On the first night she was quite ill and violently vomited all night but was right as rain next morning. She was also very brave there and helped protect her friend from pickpockets. There was a scuffle and she was knocked down some steps and she banged her head – she was a bit shook up but ok.
At the end of July we had a lovely holiday in Clacton-On-Sea. The friends we went with also had NF so did some of their children. The children liked the fact that the others knew how they felt and what they were going through. She was also chuffed to see her idol Peter Andre’s brother there and stood at the front of the stage the whole time he was on. They were all due to go to a NF Camp with the Children with Tumours charity on 26th August. For some reason though it all fell through and it was cancelled. The children were gutted as had been really looking forward to it. Fingers crossed though it will go ahead in April next year. Courtenay is looking forward to starting in year 9 in September. She’s determined to study hard because she’s decided that she wants to become a social worker and I’m in no doubt that she will achieve her dreams as she gives everything her all. Thanks to everyone who has thought of the children and taken time to write, email and mail them as it really means a lot. Courtenay has had a up and down time since November. She has had to stop playing netball which she loved. The pain in her back has been a lot worse lately. Her paedatrician has referred her back to her orthopedic doctor for an urgent scan. Her school has been great because instead of doing PE she now mentors the other children due to her enthusiasm. She’s doing really well at school and scoring 1 – 2 years above her age level. In english it is around 3 – 4 years. We are very proud of her achievements as she tries not to let anything hold her back. On the down side, the lack of physical activity has made her gain weight, which is so self conscious about. She’s now doing her best to try and lose some. We have also been given the good news that her aunty is in remission from cancer. Courtenay is due to go to Paris with the school in July which she is looking forward to. Our family is also due to go to an NF camp in August by the charity The Children with Tumours Charity. Thank you to everyone who has taken the time to write and post to our children, it has been greatly appreciated. In August we went on our family holiday to Benidorm. We went with friends so Courtenay, Cameron and Tyanna, had other children to play with. Courtenay didn’t need this because as usual she made lots of friends around the pool both young and old. Courtenay wowed everyone by singing karaoke – she has found something she real enjoys and that’s singing. She hasn’t been too bad pain wise but seems to smile through the pain and doesn’t let on that much when she is hurting. She is still having physio which I’m not sure really is helping. They found that along with her scoliosis she has another spinal problem and another condition with her neck. She was really upset as she wanted to join rugby with Cameron but there is no way that she’d be able to do it with her problems. She has been referred to a dietician too, because partly due to her medication and also not been able to exercise, she has put on a lot of weight in the last year. She has also comfort eaten a lot since her favourite Aunt was diagnosed with cancer. Luckily, her Aunt has just finished her last chemo. Her Aunt also loves spending time with Courtenay because Courtenay really cheers her up and looks after her. In September, Courtenay and the rest of the family attended a NF camp at PGL in Surrey and it was an inspirational weekend. It was so lovely as all the children had the same condition as Courtenay and Tyanna. Cameron also loved it and made lots of friends. At the end of the trip awards were given out and Courtenay won the making us smile award which was so fitting for Courtenay! There was not one thing Courtenay refused to try, you could see that Courtenay was in pain trying things but she wouldn’t give up until she achieved what she wanted. They all did us proud. Courtenay also won school merits for high scores in History which is a subject she excels in. Thanks so much to everyone who has sent emails, gifts, cards and letters, it is such a comfort to know that people are thinking of us. Courtenay has been complaining more often about pain. The specialist brought her appointment forward by 3 months as they had interesting findings to why she is in pain. Along with her shaped spine due to the scoliosis caused by her neurofibromatosis, she has 2 other problems. She also has another condition that I can’t remember the name of but it causes a hump at the top of her spine which can become increasingly painful and he seems to think the majority of her pain is caused from this other than her scoliosis. She also has a muscle that is too short on one side and pulls her head to that side. There is an operation to correct this but the success rate isn’t that great. Courtenay has declined this and at the age of 12 we decided to let it be her decision as she definitely knows her own mind. Courtenay has also gone through a horrible period of bullying by girls who are 4 years older than her, causing her to become very upset which is unlike her. She has also gone through a period of cyber bullying, though she was more upset at what they were calling Tyanna due to her learning difficulties, than what they called her. She is made fun of about her weight gain due to the meds and also her scoliosis. Luckily the school cracked down on one girl and she was excluded – the school threatened to get the police involved too. This has helped it calm down at the moment and Courtenay has some lovely friends to help her through this. Thanks to everyone who has taken time to email, write, and post to the children. They look forward to them all and love reading about Dottie’s adventures – Cameron loves to read the letters to Tyanna and no one else is allowed to do the job, only her big brother! Courtenay has been a bit better this month. Last month and the month before that she was plagued with viruses and infections – as soon as one would go she would come down with another. She is still having the physio on her back that helps with the pain but won’t do anything for the curve. Luckily, the curve is still stable though. She hasn’t heard back from Britain’s Got Talent which means she didn’t get through. She is fine about this though as she just loved the day out and wants to try again next year. Courtenay has been a bit upset the last few weeks as her favourite auntie has just been diagnosed with colonic cancer and Courtenay found out about it and is really confused by it. Unfortunately I have also had to have a lot of visits to hospital this last month. I’ve had lots of PET scans as my consultant is very concerned about a new tumour on my knee. Tyanna has also had to see a specialist as they said the tumour under her ribs is a plexiform (which can be a rarer side effect of Neurofibromatosis) and is in danger of growing larger. They said that her NF will probably be more severe like mine but I will cross that bridge when I come to it. They don’t think it is safe to remove because of where it’s situated and don’t want to do a biopsy as they don’t think it’s sinister and think because of her learning difficulties she won’t stay still for a MRI scan. Courtenay has had an up and down past 2 months. Her pain has returned and the meds are not really helping. She has also been plagued with infections and illnesses, having one on top of the other. She currently has a nasty chest infection on top of a water infection. This is leaving her so lethargic and she is sleeping all the time. It is so out of character for Courtenay as she is usually a bundle of energy. She has settled well into Comp and made lots of new friends and has become quite popular. She has been put forward to be part of the school council and in her election speech she told them she wants to me the next Martin Luther King! She was also part of the school Stars in Their Eyes competition – she was entering as Adele but sadly on the day of the competition she came down with her latest infection. Earlier this month she went for an audition for Britain’s Got Talent. She had a fantastic day and whether she gets through or not she really loved the experience. If she is lucky enough to get through we will know by the end of January and if she doesn’t it will be in March. She has been having the physio which is helping a little but she is often in pain for a few hours afterwards. She is also taking part in a scheme for healthy eating. She is doing really well in this and has lost half a stone which is doing wonders for her confidence. Thanks everyone who has taken the time to write and send gifts to the children, it’s really appreciated. Sorry if they can’t always write back. The balloons put a big smile on their faces and was so lovely to see when they opened the boxes and a lovely balloon floated out. Courtenay has had a good month and has just come back from a lovely holiday in Kusadasi in Turkey. We almost didn’t have a holiday at all because 6 days before we were due to fly the company we were with went bust. We had to book another holiday and pay again though we will be getting most, if not all, of the money back. On holiday she spent most of her time in the pool, which is excellent physio for her and eases her pain a lot. While in Turkey she made lots of friends, especially a Turkish/Irish girl of the same age, they both broke their hearts when they had to leave but have promised to keep in touch. Everyone we met there instantly fell in love with Courtenay saying that she was the funniest little girl that they’d met with the biggest smile and that she should be on stage! Even the Turkish loved her and would always stop her when they saw her for a chat; one even said that if he ever had a little girl he would want her to be exactly like Courtenay! The holiday was event free and there were no doctor or hospital visits – this is what usually happens on holiday with Courtenay! The worst that happened was a cut foot! It took our minds off all of the doctor and hospital visits that we knew we had to come back to. Tyanna has an appointment about her tumours on 8th September, Courtenay a follow-up on 12th and I go down to London on the 28th. Courtenay has also asked if she could enter Britain’s Got Talent this year. She has a lovely singing voice so I filled the application form and sent it off. I will keep you posted on how she does. She is due to start Comp tomorrow; she is very excited but very nervous at the same time. She looks very grown up in her uniform and very smart too! Lastly, thank you so much for all the letters, cards and gifts, which were sent to the children. The stationary came in very handy for them going back to school and Courtenay has her Liverpool set all packed ready for tomorrow. The Dottie letters are a definite hit with Cameron and Tyanna, they love hearing about her adventures and always recognise the envelope that they come in. Sorry for the delay in thanking for some of the letters as we have had no access to her PO box address for the last 7 weeks. Thank you again, everything you do is so much appreciated by the whole family and we love seeing the smiles on the children’s faces. 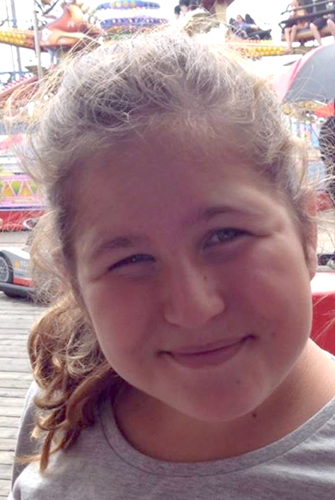 We have received some worrying news about Courtenay’s sister Tyanna this month. She had a scan as there looked to be a lump under her ribs. The scan showed 3 tumours and another on her head. These are causing her a lot of pain, though she rarely complains and uses it to her advantage thinking we can’t tell her off for being naughty! There is a high probability of them being benign and they most probably are. It is just the 10% bit that worries us. I also feel guilty for passing it on. On the good side though, Courtenay has had a good few months. Her broken fingers have healed well. She is still waiting to see the specialist for bone density scans and tests. She has coped well with the pain and is doing really well. She has been away with my parents to Aberystwyth and wowed the other holiday makers with her singing. We are due to go to Turkey tomorrow for 2 weeks after losing the first holiday when the holiday company went bust. She is also starting a diet and fitness children’s course in September. It is her own choice because she is being badly bullied due to her weight gain from her medicines. Some children are so cruel and it breaks my heart to have her sobbing in my arms about it. She is looking forward to doing it though. I’m going to do it with her as I could do with losing weight. The rest of the family are going to support her too. Courtenay has had a good month or more. She is still in pain but that is usual for her. She enjoyed a lovely week with her Grandparents at their caravan in Aberystwyth. It’s quiet there and the peace does her the world of good. She had another accident that landed her in A&E with as badly sprained arm. They are on first name terms with her now because she is up there so often! She enjoyed coming from there with a sling as it got her out of writing in school for a few days! She was gutted that she missed the Post Pal party this year, she was torn between there and going with a trip with the PLG, as it was the last year that she would have been with some of her friends, as she is going to Comp in September. She was chuffed to know that she was missed. Cameron and Tyanna had a wonderful time there and Courtenay thought the caricature of Tyanna was fab and wished she had one herself! She had a lovely time at the PLG though. She saw her back specialist on 28th and he noticed that she was developing in a bit of a hump on one shoulder. He isn’t too concerned at the moment but wants to keep an eye on it. On the good side though there is an improvement on her neck and she is able to hold her head up straighter than she could. She has been given exercises to do to improve it. It is painful for her to do this but she is getting results so she pushes herself. We have been given other physio exercises to do at home and we’re still waiting to see her physio again. Thanks to everyone who sent mail to the children as it is always greatly appreciated. Tyanna loved the birthday cards with her name on, she showed everyone as we can’t find things with her name on unless it’s specially made. Cameron and Courtenay loved their personalised things too. Also, thanks for such a wonderful party, so much work must have gone into it and we were made to feel so welcome. Courtenay has had a good month. She hasn’t had many sleepless nights due to pain and it has been really manageable this month. She had an accident a few weeks back though. We had to take her to hospital and at first they were going to operate because they thought that she had broken the eye socket. As they were looking for a bed, another maxio facial doctor examined her again and luckily found that there wasn’t a break there. They could not rule out a hairline fracture until the swelling had gone down and the bruising subsided though. She had to visit the hospital every other day for a week and half. Sabina Gatland and the girls from Sandwell Academy in West Bromwich arranged for Courtenay and her Dad to go to a Liverpool and West Brom match, along with a overnight stay in a hotel with breakfast included. When they arrived at the hotel there was a prezzie waiting for Courtenay, it was a big signed picture of Steven Gerrard, she was over the moon. Courtenay loved every bit of the match and even though Liverpool lost she couldn’t have cared less! Last weekend we took the children to Swindon for a weekend meeting of other people who have the same condition (neurofibromatosis). It was really good for her because apart from me and her sisters she had never met anyone else with the same condition. She had a lovely time and made lots of friends, the group meets up every 3-4 months so we will be going back in July. Thanks to everyone who sent the children cards and prezzies. They had a lot of fun planting the seeds too. Sorry that I haven’t updated for a while, we have been rushed off our feet with hospital appointments etc. Courtenay has had her kidney and bladder scans plus various blood tests that we are waiting for the results of. She’s had her routine appointment with her paediatrician who is referring her for other tests. Firstly to a dietician because Courtenay has put on a lot of weight in a short time even though she is eating healthily and the same amount as her siblings. He thinks that she may be retaining water so he wants to make sure of that also. Personally, I think it is because she can’t be as active as she used to due to the back, neck and leg pain from her scoliosis. It limits her a lot which can be really upsetting for her. He has also referred her back to her physiotherapist for help with exercises that may help her pain wise. He has also suggested that she goes back to see her clinical psychologist that she used to see for her behaviour and ADHD because she has started to get extremely angry again. It isn’t unsurprising with all she has to cope with, as myself and two of her siblings have NF as well and her brother has Aspergers. It’s a lot for her to cope with along with her pain, appointments etc. Something happened last month that made Courtenay’s year, she had a letter from Sabina G and the year nine pupils at Sandwell Academy. They offered 2 tickets for Courtenay and a parent to the Liverpool and West Bromwich match and they also included overnight accommodation. I was really made up with this as Courtenay’s face was a picture; she hasn’t shut up about it since! Thanks also to everyone included in the Dottie project – Tyanna and Cameron received their Dalmatian and they decided to call her Poppy. Thanks to everyone else for their kind words and letters sent to the children. I cannot thank you enough. Courtenay has had an ok month; she hasn’t been in too much pain and has only had a handful of sleepless nights. She took part in her school play and did really well in it. She had a really good school report and the teacher informed us that she is really bright. On the down side though, she finishes her work too quickly and then gets distracted and bored. She went to her Aunt’s party last week and went up on the stage with the singer and sang solo. We found she has a lovely singing voice and hit all the right notes. She sung Journey, Don’t Stop Believing (her favourite song). She had her kidney scan earlier today to find out why she keeps getting infections. Her kidneys are fine but they said that her bladder isn’t emptying properly and is retaining urine and that is why she keeps getting infections. She has written to our GP with the results and we will know more then. She is due to see her paediatrician on 25th February so I will let you know how it goes. Thanks again to everyone who sends messages etc as they make such a difference. Thanks to everyone who sent post this Christmas, the children are getting around to sending thank you letters to those who left addresses and Tyanna especially loved the reindeer letters. Thank you for everyone who posted, it was so generous of you. The children loved their parcels and Courtenay was so thrilled with all the Liverpool FC items that she was sent. I cannot say thank you enough. Courtenay has been feeling a bit better this month, though she has had yet another infection and has just finished her fourth lot of antibiotics in 5 weeks. She has now been referred for kidney scans and we are unsure how long she will be on the waiting list for. Her sister Tyanna has had a brilliant recovery from her burns, they looked terrible at first but looking at her now you can hardly tell that she’d had an accident. She has one more appointment now and will then be discharged. Courtenay is still in pain with her back, neck and legs but all we can do for that is to make her comfortable and give her pain relief. Courtenay took part in her school Christmas concert and had the part of a rapper, she was so funny and had us all in stitches. Courtenay has been upset this week as her Great Uncle passed away on Monday. It was a sudden death and not expected because even though he was in his 70’s he was in good health and full of life. Thank you very much to everyone who sent the children cards, Reindeer letters and Elf parcels, it is so much appreciated by us and the children that you have taken the time and effort to do this. They are all sitting under the Christmas tree ready to open on Christmas morning. Tyanna, Courtenay’s little sister, had a very nasty accident yesterday. She ran into the kitchen as Andrew was making burgers and he tripped over her and hot fat tipped over Tyanna’s face, chest, arm and shoulder. We are devastated. I managed to treat her in the house until the ambulance came. I put her under the cold shower but she couldn’t tolerate this and was starting to go into shock so I wrapped her in wet towels. She was then transferred from our local hospital to one with a specialist burns unit. They were concerned because the burn on her face was over her left eye and they were worried about damage to it. At the hospital she was examined and we were told the burns to her chest, shoulder and arm were superficial, but the burn on her face was a little worse. They said that the water and wrapping in wet towels helped the burns from getting worse. They think that the burn on her face is going to leave a scar. We are devastated for her because she has such a pretty little face and her Dad is heartbroken and feels so guilty. We have to take her back to the burns unit on Wednesday where we will know more. Whew, this has been a horrible month with Courtenay’s illness too and I’ll be glad when it is over, though Courtenay is almost back to normal now. Courtenay has had a really bad month this month. Her pain has got to the point where she has it by day now, as well as the sleepless nights. She is sobbing in pain now most days and all our GP will give her is Nurofen medicine because she has a problem swallowing tablets. The medicine is useless and doesn’t relieve her pain at all. She is not due to see her paediatrician for another 2 months or orthopaedic doctor for another 3 months. I have been trying to get them to rush another appointment through for her. Our GP isn’t much help because I don’t think he really understands her condition as ours is the only family with Neurofibromatosis on his books. Courtenay is still really brave though and tries to carry on as normal and fights against the pain to try and play sports but sadly she pays for it later as she is in agony after. It was also upsetting for her because I was taken into hospital with complications due to my NF. Courtenay is very close to me and found the separation difficult and worried about me with the drips etc. It was really difficult but I asked her Dad to keep her away because I hated seeing her upset by them. The children loved making the designs for the Post Pals Christmas Cards and it was a project that they managed to do together without fighting! On the good side though Courtenay won an award from the teacher for her language skills, and her reading and story writing is about 4 years above her age. She has assured me that she is going to be an author when she grows up. She also came first in her Halloween competition and she was thrilled about that. Thank you so much again for all the post, parcels etc that are sent to the children. We can’t thank you enough; they make a big difference in the children’s lives. Courtenay has had an up and down month both physically and emotionally. She has had a return of the severe back pain and has had some sleepless nights. All we can do is to comfort her and give her pain medication. She has also started to have headaches; I am hoping that her NF isn’t going to affect her the same way as myself because I have severe migraines from it. The GP has told us just to keep an eye on things for now and to go back if things persist or worsen. Courtenay’s best friend has been critically ill with a bad form of Meningitis and this affected Courtenay a great deal because they spent a lot of time together and Courtenay couldn’t understand why she wasn’t allowed to visit her in intensive care. Luckily she is now making a good recovery. Courtenay also loved to use her bike when the pain allowed her to, but sadly it was stolen from outside our door and Courtenay was heartbroken over it. We bought Courtenay a new bike for her birthday which she was thrilled about but she hasn’t been well enough to use it yet. A massive thank you for all the letters, cards and gifts that Courtenay and her siblings received, they love reading the letters and feel so important to receive them. Courtenay has had a really good month. We have just come back form a 2 week holiday in Turkey. Courtenay really enjoyed herself; she spent most of the time in the pool which eases her back pain a great deal. She is really becoming a strong swimmer and loves the physio exercises we sneak in also! This is the first holiday in 5 years that she hasn’t ended up at the doctor’s surgery or hospital. It was a close call for me though after a nasty Sea Urchin sting! Thank you so much everyone for all the lovely gifts and letters – sorry for the late reply but we have been away. The children also LOVED their pillowcases, thank you so much to everyone involved. Courtenay is pleased to go back to school; it is now her last year in Juniors before Comp next year. Also, we are really proud of her sister Chelsea who passed all of her GCSE’s and has just started 6th form to do her A levels. Courtenay has had a good month, she saw her paediatrician who says that everything is ok for now. Courtenay is waiting to be referred for hearing tests because we find that we have to say some things over and over before she answers. Firstly we thought that it maybe stubbornness but her teacher expressed a concern about Courtenay’s hearing. We are frustrated about the bone density tests because the paediatrician is no longer referring her for them. It’s difficult because that doctor doesn’t specialise in NF and wasn’t taking our concerns seriously. Courtenay has had 4 breaks in 2 years, the last she woke up in bed in the morning with. Last week I saw my own NF specialist in London and I asked about Courtenay’s breaks and if there could be a link with NF. She says yes definitely because in NF bones are more brittle and thinner. She is now trying to refer Courtenay to a NF paediatrician at Guy’s hospital. Courtenay had another accident the other day, she caught her finger and ripped the nail off, so she had another visit to hospital. She is very accident prone but the clumsiness is due to NF (or so we have been told). We are all going to Turkey for 2 weeks on 14th August so we are hoping for our first holiday without a hospital or doctor visit with Courtenay. Our holiday insurance is well used! I am so glad that fellow Pal Jon Paul is showing signs of improvement. Jon Paul, I think you are an inspiration to us all. Courtenay has had a much better month this month than the last. She has still been in a lot of pain some nights but has coped much better. She is still waiting for an appointment to see someone about doing bone density tests to see if her bones are more brittle than usual. She has had 4 broken bones in 2 years which is a lot and they have broken so easily – the last her toe she broke during her sleep and even she doesn’t know how she has done it. Apparently some people with NF can have more brittle bones than usual. Courtenay is due to see her specialist on 3rd August – she was due on 27th July but the date was postponed by the hospital. We all loved meeting you at the Post Pal party last month; it was so nice to put faces to names. We all had such a lovely time and we can’t thank you all enough for making us feel so welcome. Courtenay has had a lovely break with her Grandparents in Aberystwyth and it did her the world of good, she really had a lovely time. We had to collect her a few days early because she was going away with the school the day later, so she came home on the Thursday. I only had one night with her and then she was away again. Thank goodness though this was only for 2 nights! Thank you so much everyone who sent the children letters – Sarah H, Fleur R, Jodie, Sarah G, Seth, Kate W, and Susan C. Courtenay also had a letter from St Joseph’s Catholic College in Swindon. The teacher, Liz Howell, had heard about Post Pals during a Year 7 assembly. They thought it would be nice to write to a person on Post Pals and said that they chose Courtenay because she didn’t live too far away from them. Lots of the students wrote to Courtenay. So thank you to Liz H, Mileigh L, Mitchell S, Kyle, Megan Louise P, Gaby, Gino, Reagan, Lionel P, Angel L, Sebastiao, Olavo, Aneshka S, Jay, Macvil, Rosalia and everyone else at Post Pals. Thank you everyone for Tyanna’s cards and gifts. To LAURA – Tyanna loved the princess gifts, she’s a little Diva! Hopefully we will see you all at the Post Pals party on Saturday. We will do our upmost best to get there. It is a long way for us (an 8 hour round trip) and Courtenay has not been well this week, but I’m sure this will cheer her up no end. Courtenay had an appointment with her orthopaedic doctor today. She had more x-rays of her spine because he is concerned that she is developing a hump on one side. The x-rays show that the ‘S’ shaped curve is stable and hasn’t got any worse. There is a curve the other way that he wants to keep an eye on, but is happy with at present. There is nothing he can do to help with the pain and he said that we just have to give her paracetemol, which don’t really help. He is unsure weather the reason for her head tilting is muscular or because of the scoliosis. I just wish they could make their minds up because one doctor is saying one thing and another is saying another thing. She doesn’t have to go back to see this doctor for another 6 – 12 months. Luckily though, she smiles and jokes through it all. Thanks for all the parcels and letters sent to Courtenay and her siblings, they really love reading the letters and cards. Sorry we haven’t updated for a while – I have been at the Royal Marsden Hospital in Surrey for an operation. This hasn’t been a good month for Courtenay as she has been in a lot of pain and we are waiting for her to see someone about it. I have also had lots of hospital appointments in London which is a 4 hour drive each way from where we live and I am gone all day for them. This has had an affect on Courtenay because she is aware of something going on. I have also been an inpatient at the Marsden and Courtenay has missed me a great deal and because it is so far away from us she has been unable to visit, but we kept in touch by telephone so that helped a little. Courtenay has also broken another bone (her little toe) and we are asking for bone density tests or something similar to be done. This is the 4th bone in 2 and a half years. We are unsure weather the NF could have something to do with it as she hadn’t even bumped her foot, she just woke up with it hurting and x-rays showed the break. She loves the crutches though. Thank you for the letters and gifts that have been sent to the children, you have no idea how much a letter cheers them up. Thanks so much everyone. Sorry I’ve not updated for a while but Courtenay has had a really good month. She is coping with the pain a lot better and doing lots of after school activities. 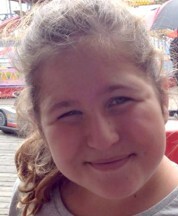 She is coming on really well at school and has none of the learning difficulties that can be associated with NF. She still has lots of visits with her physio but is at last seeing an improvement. Thank you so much for the birthday cards etc for Courtenay’s siblings, Chelsea and Cameron. They loved them. Thanks also the Valentine gifts; they were a lovely idea too. Thank you very much from us all. Courtenay has had an up and down month. She has had another bad episode of tonsillitis and other infections. She has been sick a lot and missed a lot of school. She has been in a lot of pain with her back but due to other illnesses she has been unable to go to her physio. She was chosen to be a monkey in the school play and she was very funny doing her monkey dance and had the audience laughing. She was picked to sing in the school choir and visited churches and nursing homes to sing carols. She is due to see her specialist on the 23rd December. We will update you on that in the next update. Also thank you very much for all the cards and parcels that have been sent to Courtenay and her siblings. They loved the elf and reindeer letters, its adding to the Christmas magic and excitement for them. So a very big thank you to everyone and we wish everyone at Post Pals and all of Courtenay’s friends a very Happy Christmas and a very happy New Year. Courtenay hasn’t had a good month. She had her arm put back in plaster due to breaking her thumb and she had the plaster off last Thursday. She has also had tonsillitis as well so she’s had a bad month. A big thank you to all the gifts and cards that Courtenay has received over the last couple of weeks, especially those from overseas. Since Courtenay has been back in school she’s been doing really well, although she doesn’t like her new teacher. Tyanna has gone Micheal Jackson mad. When she gets up in the morning and comes home from school, she switches MTV on and sits patiently in front of the TV until his records come on. When they come on she dances and sings. Last Friday i took her, Cameron and Courtenay to see the new Michael Jackson film “This is it”. The cinema was packed (of empty seats) there were just six of us in the cinema. We as a family are getting a bit fed up now because Tyanna has told us that she wants to marry him as well! Chelsea is in her GCSE year and says that she’s going to stay on a year, but we’re not sure what she wants to do for a career. Maybe she will decide what she’s going to do before September. Thanks again for all your support where Courtenay is concerned. We hope that everyone is having a great summer holiday and enjoying themselves. Courtenay’s holiday started with a bang as she finished school on the Friday and broke her arm on the Saturday, so the best part of the Saturday night we were in the local A+E department having her arm set in plaster. As she was due to go on holiday with her grandparents, she was worried that she wouldn’t be able to go in the swimming pool, but the doctor told her the plaster would only be on her arm for three weeks. She was vey happy about this. Three weeks later, as promised by the doctor, her plaster came off. She was told that it was only slightly broken but she needed to take care with her arm for two weeks. I took Courtenay and her grandparents (plus their dog) to the caravan park. Courtenay had a fantastic time doing everything that she wanted to do, such as swimming and dancing. She even did kareoke. On the 15th of August i took her eldest sister Chelsea up to the caravan for the night, as we thought it would be a good idea to go up the night before i brought everyone home because of the travelling distance. Hope everyone enjoys the rest of their holidays. Courtenay has had another fall and broken her right arm. She did it on the first day of the school holidays. Sadly she can’t go into any pools etc. Courtenay had an accident on the third day of our holiday in Bulgaria. She ran through the patio door as there were no safety stickers on the windows or patio doors. She ended up cutting all her knee and elbow which resulted in her using a wheelchair for the last 10 days of the holiday. Courtenay didn’t enjoy the rest of the holiday at all. She was rushed to the nearest paramedic station where she had her cuts seen to and glued and bandaged. She would have had them stitched if she hadn’t been so stressed. When she got back to the hotel there was no concern about her injuries. We were presented with a bill for the window (300 levs) which we weren’t happy about and we also had to pay out for the hire of the wheelchair. We are claiming back medical bills from the insurance. Before this happened Courtenay was a very happy child who was in the pool all day and running around with the friends that she had made. After the accident, she was in a wheelchair for 10 days and she was bored because she couldn’t run around and do what she wanted to do. On the plane back home we were diverted to Birmingham due to pilot error – he basically overshot the runway. Courtenay was allocated an extra two seats due to her injuries, but ended up having one extra seat. She had to sit with her legs across Sharon which wasn’t comfortable for either of them at all and we finally got in to Cardiff 5 hours later via bus. Where Courtenay’s back is concerned, she is attending physio to strenghten the musles. She has to go back to Newport to see the specialist at the end of the month, so i will keep you posted. Last Saturday, Courtenay, Chelsea, Cameron and Tyanna, were involved in the local carnival. Chelsea and Courtenay were lady in waiting and flower girls on the head float. Cameron and Tyanna were dressed up as pirates on the third float and they all looked fabulous in their costumes. A big thank you to all of the support, letters, etc, that Courtenay and the rest of my children receive from Post Pals. 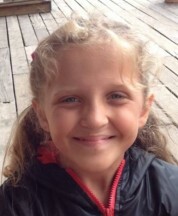 We have just arrived back after 2 weeks in Bulgaria with Courtenay and her siblings. We had a horrendous time as Courtenay ran through a glass patio door that she thought was closed because there were no warning stickers on it. She suffered bad cuts to her knee and elbow and she had to be rushed to hospital and then return daily for treatment. She spent the last 11 days of the holiday wheelchair bound and couldn’t enjoy the beach or the pool etc. I felt really bad for Courtenay because she was so looking forward to this, but she is also lucky as it could have been a lot worse. Courtenay has had a great deal of pain with her back and neck this month and because of this her behaviour is beginning to deteriate. At her hospital visit we were advised that Courtenay should have a series of physio therapy sessions to try and strenghten her back muscles. If this fails then Courtenay will have to have an MRI scan. After that we will be told what treatment she will be having. Due to this constant pain she has been advised to finish football and she didnt like that news at all. Courtenay has been very excited the last couple of weeks because we’re going as a family to Bulgeria for 2 weeks. She has been trying to organise the areoplane seeting arrangements. Courtenay’s mam is very nervous at the moment because she doesn’t like dentists and she has to go to the University Hospital of Wales to have a wisdom tooth removed tomorrow. A very big thank you to all of Courtenay’s friends on Post Pals for all their support, love and best wishes. Courtenay has not been well this week and is home from school because she has had a very bad chest infection and been staying in bed mostly. It has knocked the stuffing out of her leaving her with no energy. Her doctor has also told her that she can no longer play in football matches. This has greatly upset her because she was so limited as to what she was allowed to participate in. On the good side, he has told her that she can take part in light practices but has to refrain from the match at the end of practice. Courtenay has had a good month, although her behaviour is deteriorating due to the pain she is in. Courtenay has to go back to the hospital on the 24th April to have a further check up. Hopefully we will find out what is happening with treatment this time. We are trying to keep Courtenay as active as possible. If the weather is fine she goes to her friends and plays on the trampoline or Sharon takes her for walks etc. Courtenay’s sister Tyanna has started Brownies too and enjoys it very much. She is only five and gets tired very easy though. I took Courtenay, Cameron and Tyanna out on Tuesday. They didn’t know where they were going. I told them we were going to get Sharon’s birthday present. They soon changed their attitude when I pulled up outside KFC. The three of them enjoyed it very much and they enjoyed Adventure land even better. Courtenay has had a fairly good school holiday so far and hopefully the rest of the holiday will be just as fine. Thank you to everyone for their kind support regarding Courtenay and a happy belated Easter to you all. Thank you very much to Sarah Gilligan for your lovely letter and activity packs, it was very nice of you to think of us. It will give us lots to do over the Easter holidays. Thank you to whoever sent Courtenay the teddy bear. She has been in so much pain this month and having a hard time of it. She’s needed lots of cuddles. The teddy bear really cheered her up. Luckily, complaining about her postponed appointment did the job for once and they have rushed her an appointment through for the 27th. I will keep you posted with the results. Courtenay has had a problematic month which has affected her behaviour. She has been suffering from a lot of pain in her back and neck. The specialist in Newport had to cancel Courtenay’s appointment because of annual leave. This appointment was pushed through as a matter of urgency because of the pain that Courtenay is having. We were told that a new appointment would be sent out as soon as possible. Both Courtenay’s mother and I were very annoyed over the matter and we made a complaint, so hopefully we will hear something soon. The scan that Courtenay had on her tummy went ok and we will know the results when she sees the doctor. Courtenay’s Nan has bought a new puppy which they’ve called Taffy. Courtenay has spent quite a lot of time at her Nan’s since the new puppy arrived. She loves having the puppy on her lap and stroking it. The puppy was allowed out for the first time last week. It is getting carried more than it is walking at the moment. I think it will be a different story when the puppy gets bigger. Sharon went out and bought it some squeaky toys last week – they will drive Sharon’s father mad. Sharon’s father was also taken into hospital at the weekend which upset Courtenay very much. Courtenay has had a good month considering she is in a great deal of pain with her back. Although she is in pain, Courtenay is trying to keep as active as she can by playing football. She has an ultrasound on 13th February in Caerphilly hospital. We will let you know the results as soon as we receive any feedback from the hospital. Courtenay, Cameron, Tyanna, Sharon and I, went to see Aladdin with the school to Cardiff’s New Theatre. We had brilliant seats and we all enjoyed it. Peter Barlow from Coronation Street played the part of Jafar the evil Wizard and he did a good job as well. The pantomime was in 3D which was very effective; it made us jump in some parts of the play, but we all enjoyed it just the same. We got home to New Tredegar around 6.00pm and very tired. Courtenay is doing really well in school, especially with her reading. She is in front of the rest of her class in this subject. She gets on very well with her teacher and he always has good things to say about her. She is also doing really well with her violin class in school and she was very excited when she found out that Sharon and I had bought her a violin of her own. A couple of weeks ago, along with a few of her class mates, she entered a dance competition which was held at her elder sisters Comprehensive school. She did very well and they are supposed to be doing another one shortly. On 31st January we went to McDonalds and then we went to a local Kids Adventure Land for Cameron’s 7th Birthday. Courtenay, Cameron and Tyanna were very tired when they got home, but they enjoyed themselves very much. A big thank you to all of Courtenay’s friends at Post Pals for all their support love and letters. Courtenay has had a much better few months. The pain has not been so bad and she has handled her emotions much better. At the beginning of December she had an appointment with her paediatrician. The doctor thinks that it is important for her to have an ultra sound scan on her kidneys. She also needs another type of scan to check for tumours in her tummy. The doctor is also trying to rush her spinal doctor, due to the decline in her condition. She has also recommended that we and Courtenay take another course with Courtenay’s psychologist. Courtenay has had a very busy and exciting month. She was fantastic in her school play. She had the part of cuddly dog. Courtenay also had another concert with her Brownie troop. She was dressed as Elvis and we all fell about laughing at her in her outfit. She even borrowed her sister Chelsea’s guitar to look the part. Christmas was a very busy day in our house hold. Courtenay woke the entire family at 4am and would not go back to sleep. We eventually gave in to her nagging at 5:45am. Courtenay was thrilled because she had a laptop and Wii from Santa; we hid the laptop until later on in the day. For New Years Eve we allowed her to see in the New Year but this backfired as she got wound up and didn’t go to sleep until 3.00 am. Courtenay’s parents would like to thank all of the Post Pals that sent Christmas cards and gifts to both Courtenay and the rest of her siblings. The children loved the letters from Santa’s reindeers as it helped to keep the magic alive and build up the excitement until Christmas day. Thank you everyone so much for the lovely cards, letters and gifts that were sent to Courtenay P and her siblings. They especially loved the letters from Santa’s reindeers. It is keeping them so excited. I’d like to wish everyone a very Happy Christmas and lots of prayers for everyone. This month has been both up and down for Courtenay. She has been in a lot of pain this month due to her scoliosis. The pain has been very intense which has caused Courtenay to lose sleep and this has been very difficult for her. In turn, understandably, this caused her behaviour to deteriorate which has caused her to be very aggressive and bad tempered towards her siblings. To give Courtenay and her siblings a break she went to stay with her Auntie for a couple of days which she really enjoyed. This month also has ups. On October 3rd Courtenay celebrated her 9th birthday. She enjoyed reading the letters and cards that she received from Post Pals. She even took them to school to show her friends and teacher. She had fun at her school Halloween disco. She dressed as a little devil and looked very cute in her outfit. Thank you once again for your kindness towards Courtenay. Courtenay’s had a very good month so far. She came back from her grandmother’s house in Northern Spain to rain drenched Cardiff. Courtenay started back to school and has got a new teacher. She doesn’t like him very much because he tells her off every now and then for getting her numbers the wrong way round (her number 5’s). I had a talk to her teacher this morning about the matter and apparently Courtenay isn’t the only member of her class that is having problems. Apart from that she is doing great. Courtenay is in the top band for spelling and reading and is getting on great with her school mates. Courtenay is now in Brownies and two weeks ago, along with around fifteen other girls, she enrolled. This was a special enrolment because they had to enrol in sign language. This was a major achievement for Courtenay because of the complexity of sign language alphabet. She accomplished this with flying colours. Two weeks ago Courtenay got to stay at her cousins on a sleep over. She enjoyed this very much because she got to stay up extremely late – until 3.00am. When she got up on the Saturday morning she had a chocolate breakfast, so she was most probably mental for the majority of the Saturday morning! In football, her uncle Adrian (her football coach) informed me that Courtenay would make a fantastic winger because she is fast with the ball. She is doing really well in football and this year so far she has won two trophies. The way she is going we will have to have a shelf just for her trophies! Sharon had to go up to Guys hospital in London on Thursday for her results of her biopsy. Everything was fine; in fact the doctor was very impressed with Sharon’s weight loss. Her weight was causing Sharon a great deal of discomfort, especially where the tumour is situated (in Sharon’s back). Her doctor is that impressed and happy with Sharon that she doesn’t want to see her for another nine months. Good news all round. The only problem that occurred was the transport side of things. Guys hospital would not supply Sharon any transport this time round and told her that she had to provide her own transport. This meant that Sharon had to get up at 4am to be in Cardiff to catch public transport to London. Sharon didn’t get back home until 10.30pm Thursday night which meant she was extremely tired. We have just got back from Alcudia. We had a fun packed two weeks and went to lots of different places, such as the beach and hydro park. Sharon went paragliding while we were at the beach. This was my wedding anniversary present because it was something that she wanted to do and she enjoyed it very much. At the end of the first week Sharon and I took Courtenay and Cameron to Hydro Park where there were at least 10 different kinds of slides, a wave pool, and about 6 different pools. Courtenay had a tough time during the second week because she had blisters on her shoulders. She had to stay out of the pool and sea for a few days until they dried up. We made lots of new friends and the weather was very hot. In the evenings we saw tribute bands to the Jackson Five, Spice Girls and High School Musical. The Jackson Five had Courtenay up on the stage with them and called her the sixth member of the Jackson’s. On 24th August, Sharon and Courtenay are going back to Spain to spend two weeks with my mother and step father at their home. Courtenay is looking forward to this as she will be able to have one to one attention with Sharon and see my mother. Thanks for all your support and friendliness towards Courtenay. She would like to thank everyone for their cards, letters and presents. She loves receiving it and reading her mail. She keeps it all in her keep sake box. She was also thrilled when Kim from the Nintendo magazine wrote to her (Kim also has Neurofibromatosis) and told her that if she drew a picture of her favourite Nintendo character she would print it in the magazine. Courtenay drew a picture of SpongeBob SquarePants and Kim kept her promise and printed the picture. We were all very proud of her. This was a brilliant achievement for Courtenay because she has never had anything printed before. On 13th June Courtenay went on a school trip to Drayton Manor. She was so brave as she went on all the thrill rides and wasn’t the least bit scared. The only rides she didn’t go on were the ones she was too small for. She had a brilliant time and bought lots of joke gifts to play on people during the journey home, including fake snot and dog poo YUK!! On 20th June I (Courtenay’s mum) had to go into hospital for surgery on my foot (a removal of a NF tumour). Luckily it was day surgery so I was home the same day. Courtenay was great trying to look after me; she was fetching things for me over the weekend. I was in a lot of pain and I had to go back to the hospital with a blood clot in my leg. Over the next week I was back and forth to the hospital for scans. It was Tyanna’s birthday on 21st June and so Courtenay’s dad took them to McDonalds in Newport. From there he took Courtenay and her two sisters and cousin to a local adventure play centre. They were gone the majority of the day and Courtenay had a great time and let off a lot of steam. On 26th June I had to go to the Royal Marsden hospital in London (which is a four hour car journey from New Tredegar) for a biopsy on the tumour in my pelvis. It was difficult for Courtenay as I had to leave her and she is very clingy to me. She had the driver in stitches when he picked me up. Whilst I was in hospital Courtenay had another football presentation where she was awarded another trophy. It was presented to her by Darcy Blake who plays football for Cardiff City Football Club. He lives in the same town as us. Courtenay was very proud of herself and so were the rest of her family. Courtenay doesn’t let the NF and Scoliosis get her down. We are hoping the next month will be a better one as currently I have to inject myself with blood thinners on a daily basis. We are awaiting the results of my biopsy from Royal Marsden too. Courtenay has really tried to look after me this month and she has taken it in her stride when she’s had to be left with relatives while I’ve been in hospital. She is excited about the school summer holidays and I’m sure she’ll be keeping everyone entertained and she hasn’t lost her smile. Thank you to everyone for Courtenay’s post, you have been so kind and she is thrilled to receive it. Courtenay has been thrilled with all the kind letters and cards that people have sent her. She has especially loved the handmade ones with her name on. It has been keeping her busy trying to reply to all the letters. She enjoys reading them to me and it’s also helping with her reading. So thank you for accepting Courtenay on the Post Pals site, it has been so lovely to see her face light up every time she has post. On 7th May Courtenay had an appointment with her psychologist. There isn’t much she can do to help us at the moment because we insisted from the start that we didn’t want Courtenay to have medication unless we had a 100% diagnosis for the ADHD or things worsened. Now we don’t have to see her for 6 – 12 months because we decided to go along with the behavioural therapy option at home. We strongly believe this is better for Courtenay as she needs consistency. On 17th May Courtenay’s brother, Cameron, had his official diagnosis for Asperger’s Syndrome. This didn’t come as a shock as his autism specialist already said she was 99% certain he had it and it was just a case of one more person going to see him in a school setting to confirm for sure. In a way it is a relief to get it in writing because we feel we have closure and know why Cameron behaves as he does. He is a lovely little boy just a little different. Rough play as other boys his ages do frightens him as he prefers his own company. It also helps because he can get the extra help at school. On 19th May Courtenay played in a football tournament although she could only manage 2 minutes of play due to pain. Despite this, her team ‘The Wasps’ won the whole tournament and each child came home with their own trophy. Courtenay came into the house grinning from ear to ear, she was over the moon and we were so proud of her. On 27th May Courtenay had an appointment with her paediatrician. She informed us that she was still unsure whether Courtenay’s behaviour is due to ADHD. We are frustrated at this as at the end of the day we’d like closure and a diagnosis for Courtenay’s sake. It’s not fair on her being shipped back and forth. Despite this she agrees that Courtenay does have very bad behavioural problems that she says are probably due to the Neurofibromatosis. She wants us to go to child behavioural classes which I refused. I’ve done about 5 so far; they don’t help and are not suitable for Courtenay because her behaviour is not always her fault. We find the behavioural therapy we did with her psychologist is far, far better for her. Courtenay thrives on one to one attention, we try our best with this but it is not always easy because having all 4 children with special needs and having a lot of problems due to NF myself, it is hard to split our time. Courtenay recognises when her behaviour is out of control and when calmed down she always apologises and feels really bad about it. Courtenay started Brownies on 28th May. They were starting a group near us and she wanted to join although was a little concerned that it may be too girly for her as she is a tom boy! She is already a member of the scouts, football, youth club and after school club, so she is a busy little girl! She loved it though and it all her fears were quashed. Courtenay was the most chatty and energetic but her leaders were brilliant with her. They were trying to organise a summer trip out and asked Courtenay where she wanted them to take her and she said Spain! I’ve taught her well! She enjoyed the whole session and can’t wait to go back next week.